Peter Moore hit the nail on the head. Over 30 Thousand Joystiq readers voted on what consoles they’ll likley end up buying and the vast majority plan on getting a Wii and 360. Wii on its own scored very strongly as well. 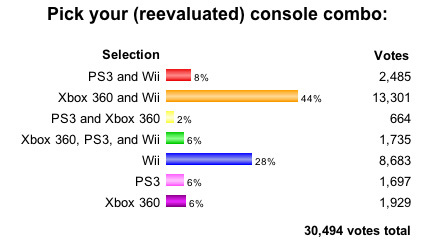 This is hardly a scientific poll, but I’d say the PS3 has a real upward battle against the competition. Even Xbox 360 alone is edging out PS3 (if albet by less than 300 votes). I remember at this time last year all the Sony fanboys were giggling and talking about how MICROSUXXXXX WAS GONNA GET PWNED by the 133T PS3. Combining every PS3-inclusive category into one, it still doesn’t reach the percentage of people who ONLY want the Wiivolution. I am amazed and awed at what has transpired here. Nintendo from behind, FTW!